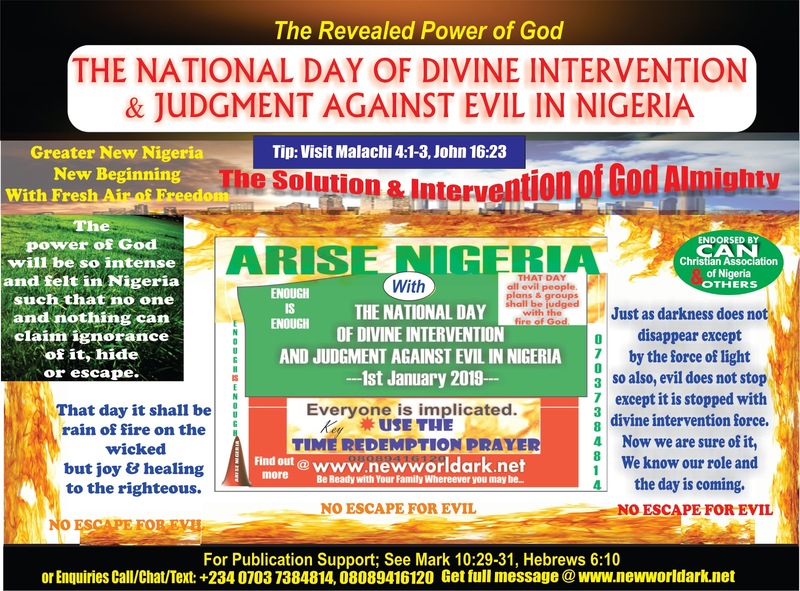 The National Day of Divine Intervention and Judgment against Evil in Nigeria is the miracle work of God to set Nigeria and Nigerians free from all forms of captivity and evil plans. 1. 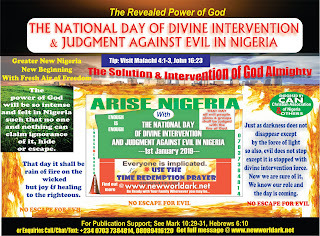 On the night of the national day of divine intervention, specifically and very importantly, evil plans and their sponsors in and outside of government or positions of authority (boko haram, ritualists, herdsmen militia and all those killing human beings for evil ) who refuse to repent and confess before that day shall not survive; they shall be judged with the fire of God while the good people shall triumph and takeover. 2. There shall be massive healing miracles in Nigeria with all those who seek God; mad people shall be set free effortlessly and many hospitals shall be emptied without anyone attending to them but by the power of the Holy Ghost. 4. There shall be great grace and power to the righteous. That day, the divine mandate for Nigeria’s leadership of the world will commence. The power of God will be so intense and felt in Nigeria such no one and nothing can claim ignorance of it, hide or escape from it. So everyone is implicated. Beloved, it is not a joke and it does not demand anything from you but only to offer yourself in prayer of the Time Redemption right from where you are if you want to stop complaining of evil. That night/day is the Crossover night that is on the 31st December 2018- to the 1st Day of January 2019. It shall be a new beginning for Nigeria and for many people- but it carries a unique responsibility which is the Time Redemption Prayer. “You should compulsorily STAY UP, AWAKE AND ALIVE by the hours (11pm 12am and 1am at night and 12noon by the day. You should plead the Blood of Jesus Christ by the top of hours revealed 11pm, 12am and 1am at least SEVEN TIMES (7) each on yourself, (name), day/date and Nigeria. For example I cover Nigeria with the Blood of Jesus Christ. Please share and God bless you and reward you and keep you until that day as we see the miracle of God like the deliverance of Israelites from Egypt unto the Promise Land. After that day, we shall have peace like never before and like never before. It is not everything that one should say…you know. They are many evil plans in Nigeria on that same day and this is the only solution for Divine intervention revealed right now. Don’t neglect it. Don’t keep complaining because now you know what to do. God shall not ARISE. We should ARISE with the National Day of Divine Intervention & Judgment Against Evil in Nigeria. My Name is Ijigban Daniel Oketa and made bold to say that if it not God who sent me with this revelation then I should be judged for evil today and on that day. I am a servant of God and this is in the unity of the faith endorsed by the all Christians Association of Nigeria and Faith Organizations. 2. We need divine judgment and justice in Nigeria. 4. You need to be among the generation of Nigerians that should lead the world. Using the Time Redemption Prayer; pleading the Blood on yourself, the day or city/country by the time is to redeem all things including yourself from any evil daily and continuously. Nigeria’s leadership of the world in the glory of God shall begin on the 1st January 2019, if the Time Redemption Prayer is used in unity by the peace loving people and servants of God as evil powers and plans are destroyed. Remain bless- Please share this to your family/group/colleagues. You can download or read the full message @ www.newworldark.net or call/chat/text 07037384814 now. You may not believe but the truth is that God has revealed the solution of Nigeria to us. It now depends on if or how they use it. It is the National day of Divine Intervention and Judgment Against Evil in Nigeria.